Unidentified photograph of a young man, ca. 1860-1866; digital image 2012, privately held by Melanie Frick, 2013. 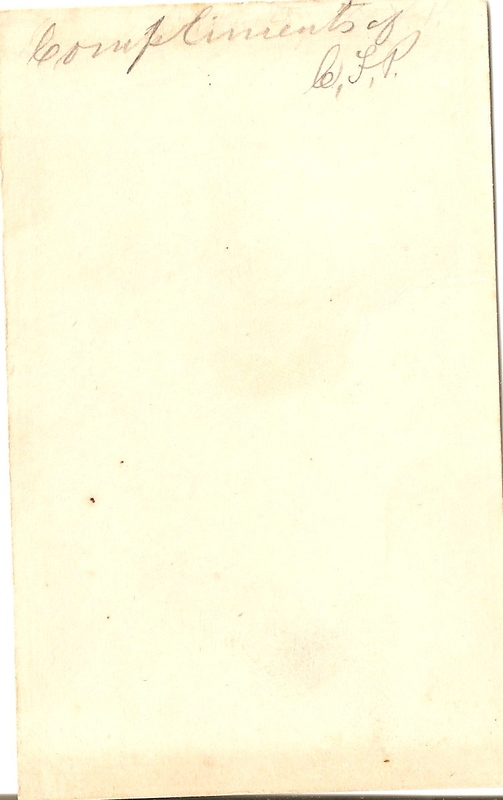 “Compliments of C.F.P.” is inscribed in pencil on the back of this unidentified photograph of a young man. He has a high forehead and wavy hair; there is a firm set to his jaw and his dark eyes hold a steady gaze. His jacket is buttoned to the top, revealing a high collar and a snippet of a checked necktie underneath. The young man’s hairstyle, longish and brushed back from his forehead, reflects this era.2 His knotted necktie may be fastened with a stickpin and reveals a bit of checked fabric just above the collar of his coat. His coat does not seem particularly fine; it is loose-fitting and looks to be made of wool. Although unidentified, this carte de visite comes from an album that traces to the family of Jesse M. Smith of Henry County, Iowa, although other families may be included. This particular photograph offers no clues as to where it was taken, although many of the photographs in the album are from Iowa with a few from Kansas and Missouri.3 It’s anyone’s guess as to who C.F.P. might have been. My estimate for the age of the young man is perhaps between twenty-five and thirty; his high hairline suggests to me that he is probably not much younger. His apparent age suggests a date of birth between approximately 1830 and 1840, depending on the year that the photograph was taken. Perhaps he was unmarried when he inscribed this photograph and presented it to a young lady he admired; of course, it could also have been given to a family member or friend. Did C.F.P. serve in the Civil War? Although he is not in uniform in this photograph, that doesn’t mean that it might not have been taken as a memento for his loved ones before he left home. What are your thoughts about the elusive C.F.P.? 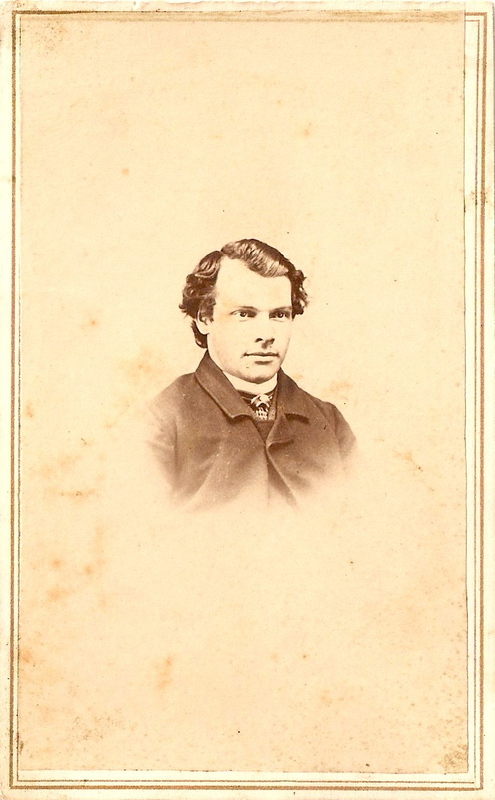 1 Georgen Gilliam Charnes, “Cartes-de-Visite: The First Pocket Photographs,” Nantucket Historical Association, 2004 (http://www.nha.org/history/keepinghistory/KHcdv.htm : accessed 1 November 2013). 2 Maureen Taylor, Fashionable Folks: Hairstyles 1840-1900 (United States: Picture Perfect Press, 2009), 53. 3 Jesse M. and Elizabeth Jane (Baker) Smith Album, ca. 1860-1920; privately held by Melanie Frick, 2013. This entry was posted in Photograph Analysis and tagged 1860s, CDV, unidentified on November 1, 2013 by Melanie Frick.